The Sandyford Hotel Glasgow provides quality accommodation in Glasgow, in a perfect location for anyone wishing to take advantage of Scotland's fantastic hillwalking, scrambling and climbing. Scotland's highest mountains (above 3,000 feet) are known as Munros, and mountains between 2,500 and 3,000 feet are called Corbetts. The highest mountain in the UK is Ben Nevis, at 4,409 feet. There are nearly 300 Munros around Scotland, and they were first recorded in 1891 by Sir Hugh Munro. The popularity of climbing the Scottish Munros has given rise to the term "Munro Bagger", which refers to any climber who is attempting to climb the entire range of Munro mountains. Ben Lomond is a popular mountain for visitors to Scotland, as it is the nearest Munro to Glasgow and because it overlooks Loch Lomond. Another popular walking route is the West Highland Way, a well signposted walking route from Milngavie in Glasgow, to Fort William. 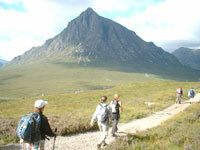 Officially opened in 1980, The West Highland Way is 95 miles in length and is used by around 50,000 visitors annually. Cheap bed and breakfast accommodation is available at hotels along the route of the West Highland Way.